After a week of turmoil surrounding Brexit and Theresa May’s failed attempts to agree a deal with her fellow MPs, there has not been much to smile about when discussing Europe. However, in the case of Sarah Beckett, she has every reason to be upbeat when it comes to sport and our continent. On Wednesday night, the England international’s Twitter feed was a homage to Liverpool FC as Sadio Mane’s delightful double and Virgil Van Djik’s towering header saw Jurgen Klopp’s side defeat Bayern Munich in the Champions League. And her positive mood will only increase if the Red Roses can secure a Six Nations Grand Slam this weekend as they aim to become the cream of the crop in the northern hemisphere once again. England brushed aside Ireland, France and Wales before producing a scintillating nine-try performance against the previously unbeaten Italy as they made it four wins out of four last Saturday. At a blustery Exeter, England shone and Beckett was one of the standout performers as she was awarded Player of the Match in only her fifth international appearance. “The Italians were a physical side, but we managed the game really well and really took control,” Beckett says. “The forwards, including myself, really took pride in hitting them hard to try and put them on the back foot to try and get some purchase in the game. Beckett’s eagerness to highlight the team as a whole is unsurprising. The Red Roses are making people sit up and take note, which was emphasised last weekend as a record attendance of 10,545 crammed into Sandy Park to get a glimpse of this new and exciting era for England women’s rugby. Since the Rugby Football Union announced the introduction of full-time contracts in the women’s game at the beginning of 2019, England have delivered a booming statement. It is absolutely right that this talented squad is receiving praise as they aim to regain their Six Nations crown and Beckett’s rise just goes hand in hand with the vision the RFU have for the Red Roses. Beckett has burst on to scene after making her international debut against the USA last November. The Firwood Waterloo player admits she ‘didn’t know where she stood’ at the end of last year, but the 20-year-old was named in England’s EPS Squad in January. 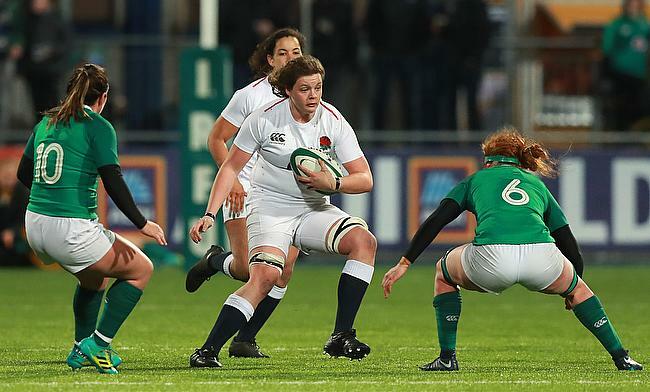 She has now become a regular for England during the Six Nations and the flanker also grabbed her first try in their 51-12 victory over Wales at the end of last month. “It has been a whirlwind!” says Beckett. “I think you have just got to take everything within your stride. I am surrounded my so many great players who are helping me improve all of the time. The international pace of the game and the standards we set ourselves are so different to what I have been used to before. It just pushes you to want to be better because you are surrounded in this environment. “It was unbelievable to pick up my first cap in the autumn and after that, I wasn’t really sure where I stood, but I then got the call about the contract. I was with my Mum. I am the sort of person who doesn’t like to celebrate too much, but when I told my Mum after the phone call, she went absolutely crazy! Her fortunes don’t seem to have waivered over the last five months and that support which Beckett alludes to from her 'rugby' family has been a factor. Her father, Mark, played for Waterloo as did her granddad and uncle. Her twin sister, Kate, is enjoying rugby at university while brother Charlie represented Gloucester and is currently with Jersey Reds in the Championship. “I remember growing up, Kate wasn’t into rugby very much but it is great to see her now really enjoying the sport we all love,” she says. “It is great to see her thriving and myself and Charlie have really been involved with the game since we were little. “It is great to have their support and obviously having a brother there to support me with things that he has learnt from his professional career is great. My Dad has been coaching me and my Mum has just been amazing as she been up and down the country giving me the best support. The Beckett family will be once again showing their support this weekend as Sarah makes her first appearance at Twickenham, with the Grand Slam on the line against Scotland. Whilst England have flourished in the Six Nations, Scotland have struggled. They currently sit bottom of the table having lost all four of their matches and there have been suggestions that England have the title and the Grand Slam already wrapped up. Your #RedRoses squad to face @Scotlandteam on Saturday at Twickenham ?? Don't forget, entry to the match will be free of charge after the men's game ?? But Beckett is quick to dismiss that notion: “We haven’t really talked about what is at stake on Saturday. The realisation of a Grand Slam is there and we are all aware of it, but we know it is going to be an international Test match. No game is easy. You can’t take it as a given. If England are to achieve the Grand Slam on Saturday evening, it would be the perfect start to their new chapter as the Red Roses build towards the 2021 World Cup in New Zealand and Beckett is in full agreement. “It would be great for the growth of the game. There is now that pathway for girls to pursue a career in the game which is vital. You see we are getting more exposure and it will be great to play at Twickenham on Saturday.